A good reference list shows a detailed study and search of the author. Even though there is no consensus in categorizing academic disciplines and their subdisciplines; they can be summarized in five different categories: Medicine and Health is listed below the discipline of Applied Sciences. Each discipline bears different priorities regarding author names, dates, and publication. Right after using the information, author names, date, and the page number are given within the curved brackets. Format: (Author's last name year, page number). Example: (Smith and Wilkins 2012, 147). Note that there is no comma after authors' names. Right after using the information, author names, and the date are given within the curved brackets. Format: (Author's last name year). Example: (Smith and Wilkins 2012). A consecutive number is given for each reference, at the end of the sentence. The number can be formatted in superscript or within the square or curved brackets. Format: Number or (number) or [number]. Example: 23 or (23) or . 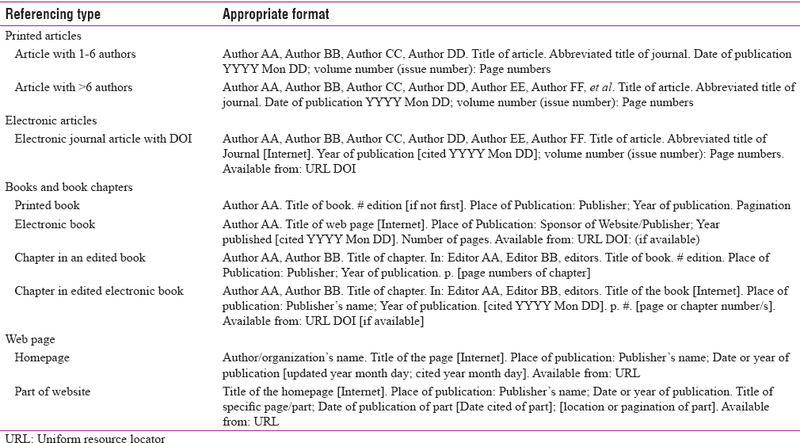 A consecutive number is given for each reference, and then, the references are listed at the bottom of the page as a footnote. Example: 23 or (23) or (23). Note that usually a line is drawn at the bottom of the page before listing references in that page. There are many citation styles with the different syntax used in academic disciplines. 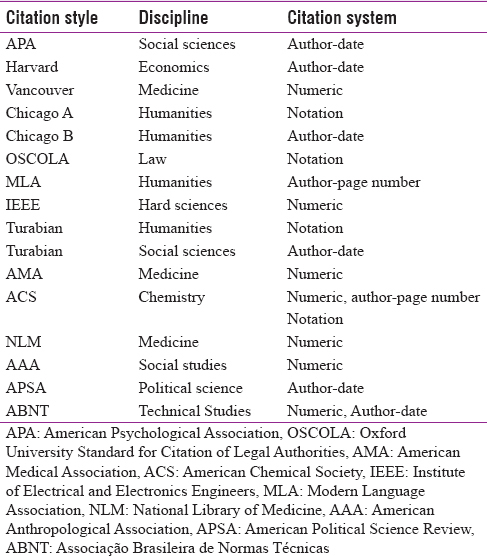 The most common citation styles, in-text citation systems, and their disciplines can be found in [Table 1]. The most commonly used citation styles in medicine are Vancouver, AMA, and NLM systems. All these are numeric systems, but they have slight differences. A consecutive number is given for each reference, immediately at the end of the information. The number can be formatted in superscript or within the square or curved brackets. The formatting of different sources in Vancouver citation style can be found in Tasble 2. This system is widely used in medical publishing. It is compatible with the rules of the International Committee of Medical Journal Editors. Do not place space before or after comma and dashes. End the reference with full stop. [Table 2] shows the formatting of different sources. Rueff F, Bedacht R, Schury G. Bite injury. Special situation as to clinical aspects, therapy and course of healing. Med Welt 1967;12:6638. Ng ZY, Eberlin KR, Lin T, Masiakos PT, Cetrulo CL Jr. Reconstruction of pediatric scalp avulsion injuries after dog bites. J Craniofac Surg 2017;28:12825. Iannelli A, Lupi G. Penetrating brain injuries from a dog bite in an infant. Pediatr Neurosurg 2005;41:415. World Health Organization Guide for Rabies Pre – And Post – Exposure Prophylaxis in Humans. World Health Organization. Available from: http://www.who.int/rabies/PEP_prophylaxis_guidelines_June10.pdf. [Last accessed on 2018 Jul 20]. Macedo JL, Rosa SC, Queiroz MN, Gomes TG. Reconstruction of face and scalp after dog bites in children. Rev Col Bras Cir 2016;43:4527. Saba MI. Surgical Management of missile injuries of the head. In: Schmidek HH, Sweet WH, editors. Operative Neurosurgical Techniques. 4th ed. Vol. 1. Philadelphia: Saunders; 2000. p. 99116. Available from: http://www.jli.edu.in/blog/why-referencing-referencing-styles-in-medical-writing. [Last accessed on 2019 Mar 19]. Available from: https://www.falconediting.com/en/blog/6-reasons-why-citation-of-sources-is-important-when-writing. [Last accessed on 2019 Mar 19]. Abbott A, editor. The context of disciplines. In: Chaos of Disciplines. Chicago and London: The University of Chicago Press; 2001. p. 121-56. Available from: https://www.scribbr.com/citing-sources/citation-style-overview. [Last accessed on 2019 Mar 19]. Available from: https://www.guides.lib.monash.edu/ld.php?content_id=14570618. [Last accessed on 2019 Mar 19].